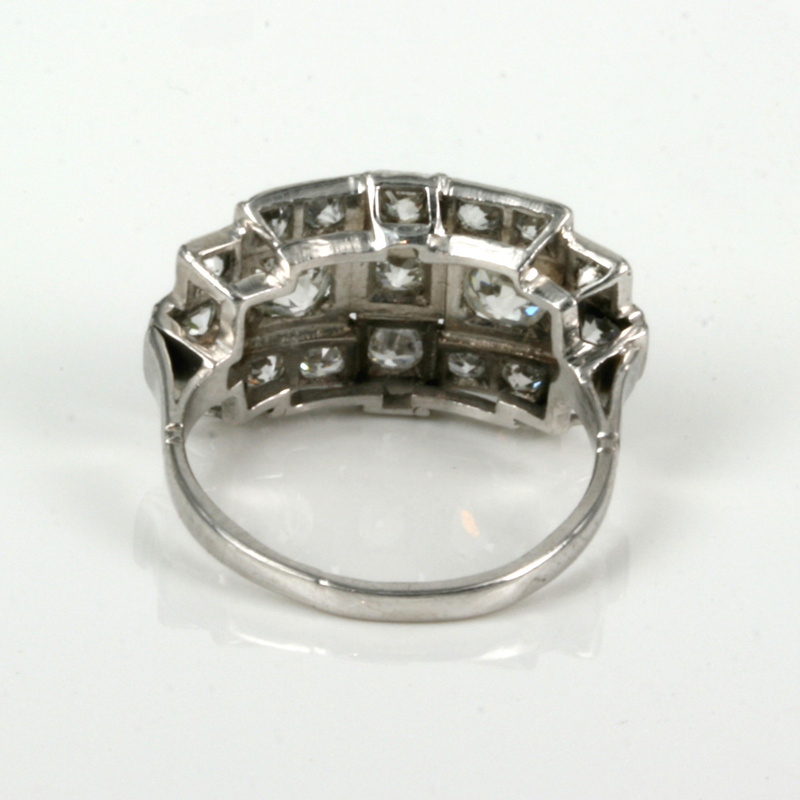 Product code: ES6068 Categories: Sold Items, Sold Rings. The jewellers of France have always been long regarded as the creators of some of the finest jewellery for centuries and the Art Deco period of the 1920’s to the 1940’s was most certainly no exception to this. 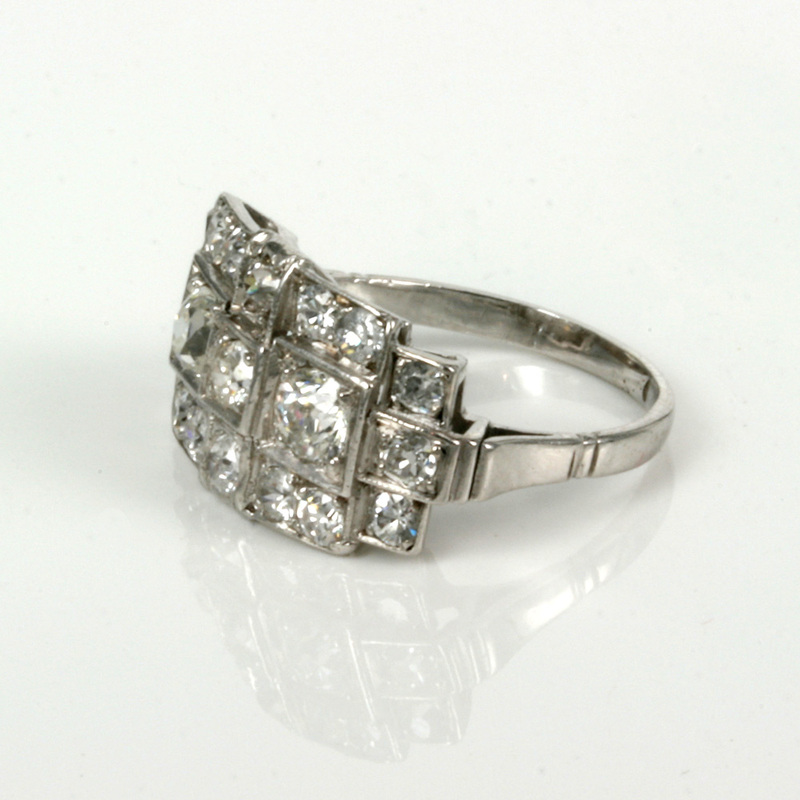 Embracing this era comes this hand made diamond ring from the 1920’s that has all the wonderful characteristics of Art Deco jewellery. Firstly it was all hand made in France in platinum which was the metal of choice of jewellers of this era to create their masterpieces thanks to its pure white colour and durability. 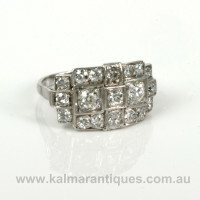 Then there is the incredible geometric design of this ring which again is typical of jewellery of the time which also includes the wonderful way that many Art Deco pieces of jewellery combine the design with a “shape inside a shape” where for example in this ring you can see round diamonds set into a square box or two round diamonds set into a rectangular setting. In the ring there are a total of 19 European cut diamonds with two having a total weight of 0.50 carats and the further seventeen having a total weight of 1.02 carats bringing the final diamond weight of this ring to 1.52 carats. Sitting so well on the finger, the ring measures 19.8mm across from left to right by 11.4mm wide at the centre. So easily able to suit any finger, this would also make a very attractive example of an Art Deco diamond engagement ring as well.